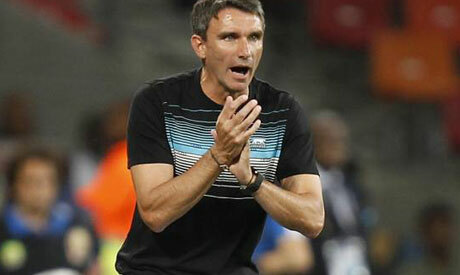 Ahly coach Patrice Carteron has hailed his squad after thier 1-0 victory in the 80th minute Tuesday night over his former club Wadi Degla in the Red Devil's third match day of the Egyptian Premier League, but added that the current season is still very tough. "The players delivered what we requested. They were able to win the three points with an obvious determination of spirit," the Frenchman said in the post-match press conference. The newly-appointed coach pointed out that the Cairo giants could have won with a bigger score, but they missed at least "four important chances." He also highlighted that "the technical staff is still handling the problem of the very tight schedule of the team" as they compete in the CAF Champions League as well, defeating Tunisia's Esperance away on Friday to close in on the quarterfinals. "We expected the toughness of the game, especially after the injury of goalkeeper Mohamed Elshennawy," he explained, stressing that it was necessary to leave the injured keeper on the field for attacking substitutes. Substitute Salah Mohsen scored the winner 10 minutes from time, giving his side the chance to advance to the League table summit with seven points, after a draw with Ismaily in the opener followed by a win over Masry. "The current season is very exhausting, forcing us to rotate the squad so as not to risk an injury for important players so that we preferred to give Amr Solya and Saad Samir a break during Degla game," he stressed. After another domestic mission against Haras El-Hodoud on Friday, Ahly are ending the Group A competition of the CAF Champions League next Tuesday hosting Uganda's Kampala City.